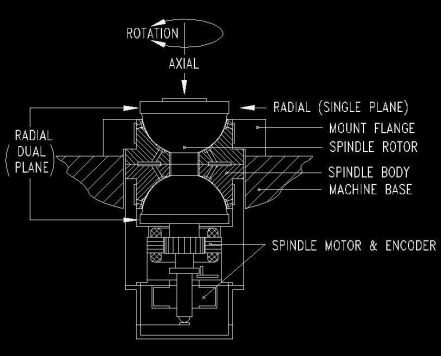 There are many different designs of Air Bearing spindles. Air Bearing Technology utilizes a unique spherical air bearing spindle design. This design has been selected over other configurations due to inherent positive qualities, such as, performance and reliability. As the industries we serve have matured, requiring more durable air bearings with non repeatable run out at nano-meter levels, Air Bearing Technology has been proactive in leading the way. Through continuous research and development, the most advanced suite of tools, and leading industry experts, we have been there to provide you with the solutions to the most demanding of challenges. Potentially unlimited bearing life. Air bearings are completely non contact, unless misused or abused, they do not wear. With a brushless motor, and an optical encoder the rotating element is non contact. Since bearing wear is eliminated, there is no bearing break-in period. Bearing life is virtually limitless. High operational speeds without vibration. With dual plane balancing and frictionless performance your equipment can operate at high velocity without the threat of vibration allowing your equipment to perform more quickly and more accurately. Frictionless performance Non contact rotation means frictionless performance. Very stiff bearings and dual plane balancing eliminate vibration and deliver exceptional rotational accuracy. Greater machine throughput, with wear eliminated, down-time related to bearings is eliminated. Reduced maintenance and downtime equals greater machine usage. Additional benefits Please call to discuss the potential benefits to your system or design by implementing an air bearing in its design. The possibilities are nearly limitless.